The eyes are shaped pieces of Hershey bar, and the mouth is a Twizzler. Very simple, but just what the client wanted. We were in kind of a rush when we made it, so we applied the frosting and decorations before the cake had completely cooled. When we got the cake to the party, the chocolate eyes had melted a bit, so they were accidentally soft and gooey for eating, in that wonderful S’mores kind of way. 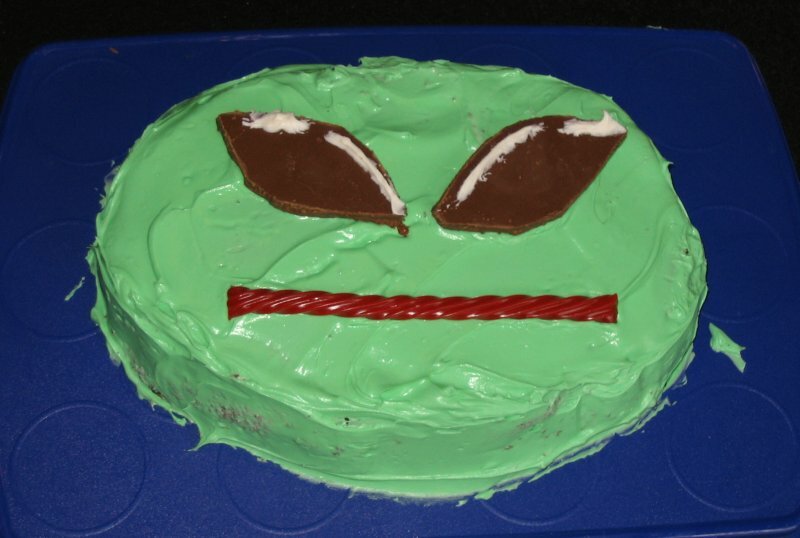 If you make something like this, take my advice: buy extra Herhsey bars, and bring them to the party, so that when all the kids start screaming “I want a piece with an eye!”, you can hand out extra eyes. (*) Due to a variety of scheduling difficulties, the party was held yesterday, about five weeks after the actual anniversary of birth.